You can also fly into one European city, and then home from a different city - and keep the price about the same. A lot of the available dates are in April, September, October, November, and December. But some destinations are showing dates available for August travel. And many destinations are even showing cheap prices over Christmas. I've identified the cities I've seen with August and Christmas availability below. But keep in mind that availability will be changing fast as dates sell out. 3. Once you get to Google Flights, click on the departure date box to open up the calendar view and browse for the cheaper date combinations. - Look for the dates that are in the $600s roundtrip. TIP: For the August dates, try selecting a departure date of August 12, 13, 14, 15, 16, 17, or 18. Depending on the destination, they are not always easy to find, and you may need to try a few different dates. Also have a look at late August to early September, over Labour Day. Some destinations are showing cheap prices in this date range as well. I've posted some more detailed info about Christmas dates below. - From Google Flights you can sometimes click through to the airline's website to book these. - Search for a flight from Seattle to your destination. 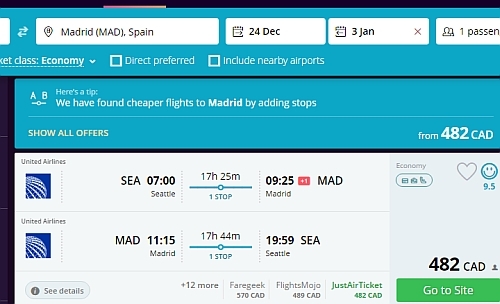 IMPORTANT: Momondo is showing you the price in $CAD, but many of the booking sites showing these fares are in $USD when you go to actually book them - so watch out for that. TIP: On Google Flights, look for the flights where the overseas legs are operated by Lufthansa or Swiss or Air Canada (better than United Airlines). You may have noticed that Google Flights only shows dates up to December 31st. Here are some dates you can try on Momondo over Christmas and into early January that aren't showing up on Google Flights. Dublin, Ireland (DUB) - Dec 24, 25 to Jan 3, 4 and Dec 27 to Jan 5. - First you should check to see if both cities you are interested in have cheap roundtrip flights available on Google Flights, and note when the cheaper dates are. The flight between the two European cities is not included. 2. On Google Flights, click on the departure date box to open up the calendar view and browse for the cheaper date combinations. flight deals, eastern europe, seattle, sea, air canada, europe, central europe, western europe, africa, northern africa, lufthansa, swiss and united airlines. 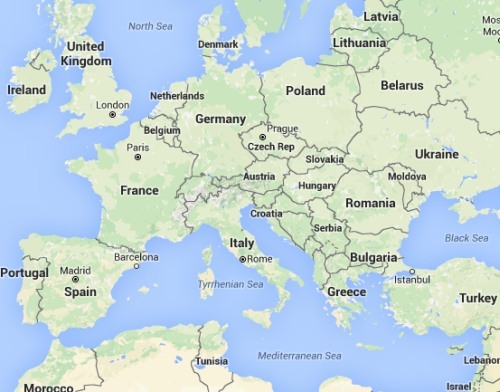 4 Responses to "Seattle to various places in Europe in the $500s CAD roundtrip | spring and fall travel, but also some in August and over Christmas"
Thanks for another great tip, Chris! Just a note that searching for my flights to Croatia, I was seeing about $650. When I went through the first two booking sites (via momondo) the flights jumped to $1100 each. The third option (SmartFares) took my booking request and sent me confirmation the next morning that they booked the tickets. Now the weird part... mid-day I get a call from SmartFares trying to upsell me on some cancellation insurance. When I told him that I've got coverage with my amex, he hung up on me mid-sentence. Super strange behaviour, but screw it, the wife and I are going to Crotia for $1200! Thanks for the info Robin, definitely appreciated. Have a great time in Croatia! THANKS Chris. Snagged Madrid for CDN557. Best part is it took me to the AirCanada Site so no OLTA. It was double that for same flight out of YVR on AC. My husband and I booked 3 tickets to Belgrade for 2033 CDN. However, when we tried to book on Lufthansa site the prices would jump up but when we went to Expedia we were able to buy it for 677 each.